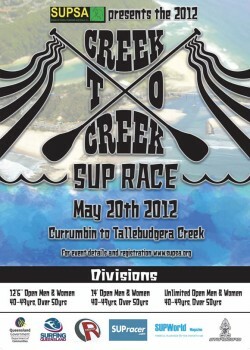 Check out the results from the 2012 Creek To Creek SUP Race, held Sunday 20th May on Australia’s Gold Coast. 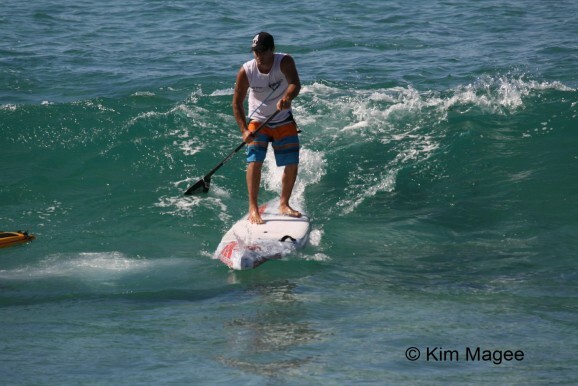 Waikiki finalist and Fanatic International team rider Paul Jackson took out the overall victory on his 12’6″, with Dylan Magee 2nd and Beau O’Brian 3rd in the stock class. Andy Davies was 2nd quickest overall and took out the 14′ division, while Matt Carter was the fastest Unlimited. 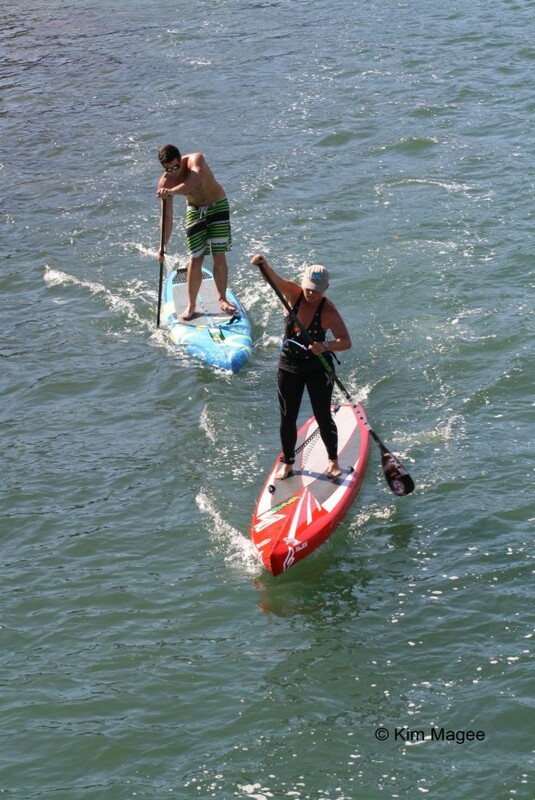 On the women’s side, Angie Jackson won the 12’6″ class and Alison Fullagar took out the 14′. 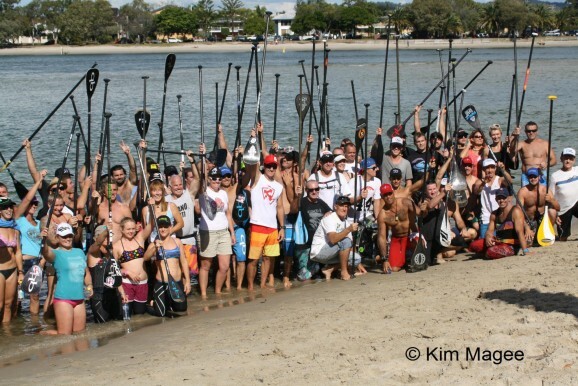 With almost 100 paddlers, this was one of the biggest (if not the biggest) standalone SUP races ever held in Australia. So a massive congratulations to the organisers, SUPSA.org and its tireless President, Troy Pease. 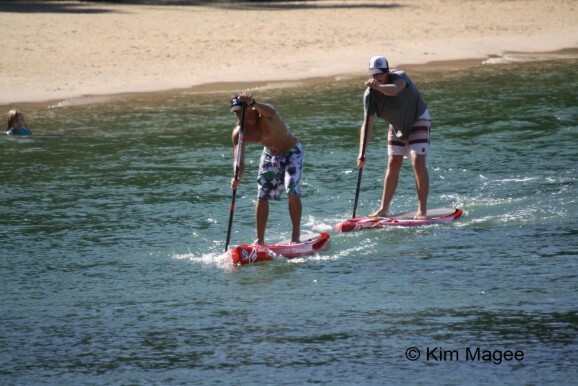 Australia has long had a good chunk of the world’s best Stand Up Paddle racers, but has never had the best races. So with the success of today’s Creek To Creek race and January’s 12 Towers race, hopefully that’s now starting to turn around. Full results below (scroll down for race recap and more photos). 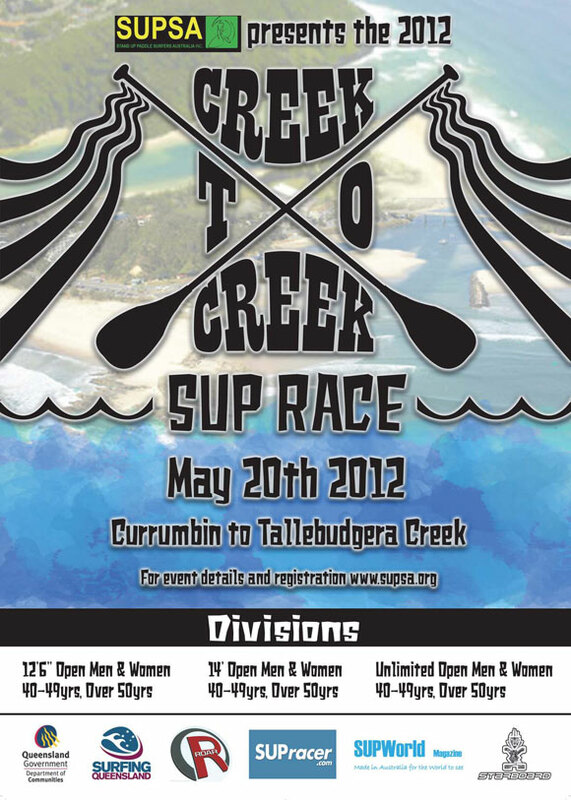 On Sunday 20th May 2012, Australia’s first SUP club, SUPSA, hosted the inaugural Creek to Creek Race, a 7km flat water and open ocean course set between Currumbin and Tallebudgera Creeks. 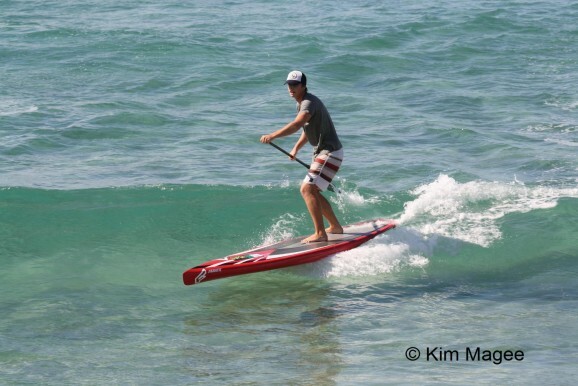 Huey didn’t disappoint and served up a magnificent Autumn day with the sun shining, tiny waves and a light seabreeze creating perfect conditions for paddlers of all abilities to join in and have a go! 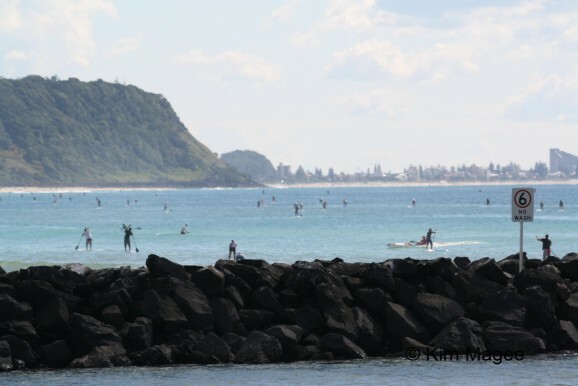 The great conditions brought the paddlers out in scores, with a record (for Australia) 90 paddlers signing up for the race including over 25 racing for their first time. 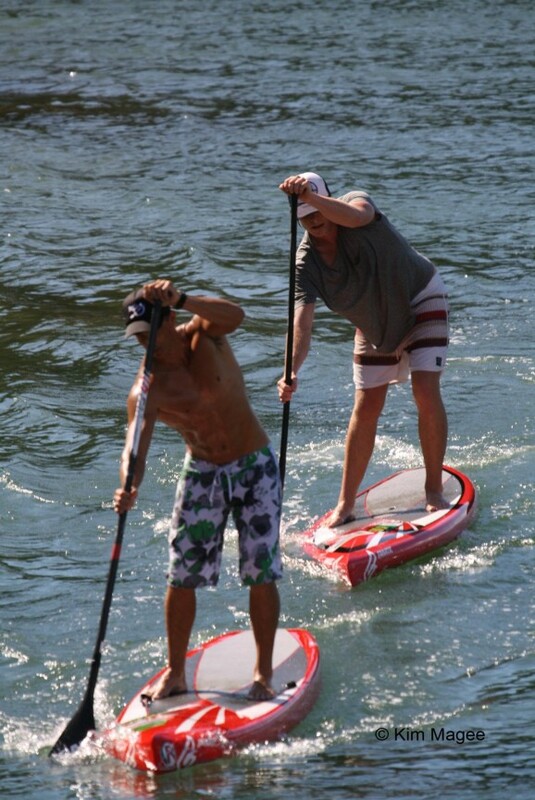 The race trialled a new handicap format (the brainchild of Club President and Race Director, Troy Pease) where paddlers were sent off at 20 second intervals, with the dual aim of giving the slower paddlers a bit of a headstart and also to separate the elite paddlers. 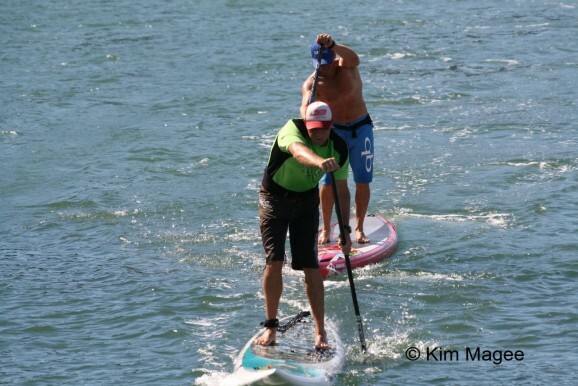 So typical race tactics went out the window and everyone had to paddle hard the whole way, not finding out who won until the times were adjusted for the presentations. 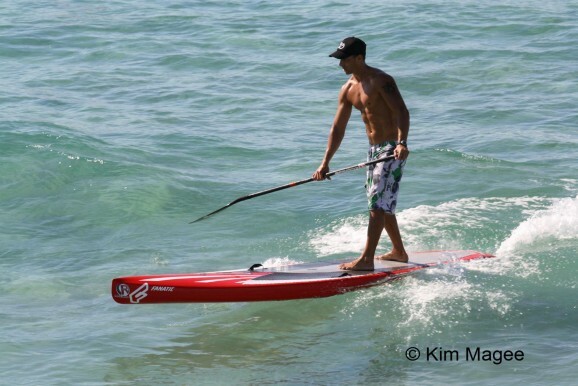 Fresh from a 7th place finish in the final of the Survivor SUP Race at the recent Waikiki Paddle Festival in Hawaii, Paul ‘Jacko’ Jackson (Palm Beach, QLD) powered home from a ‘last place’ handicap start to cross the line with the fastest overall time (42:21) for the day, winning the Open Mens 12’6” division, ahead of Andy Davies (42:37, 1st Open Mens 14’) and Matt ‘Rowdy’ Carter (42:54, 1st Open Mens Unlimited). 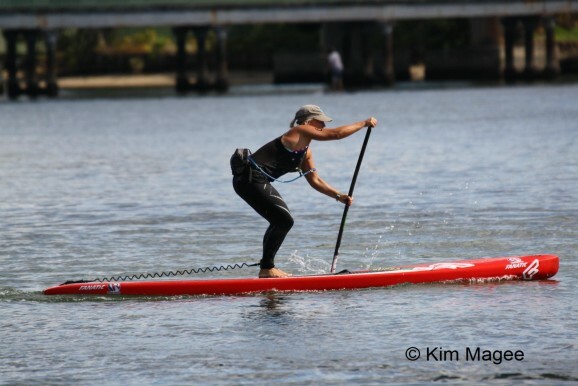 In another Australian SUP racing record, a total of 19 women took on today’s race, with local paddlers Alison Fullagar (46:14, 1st Open Womens 14’) and Angie Jackson (47:25, 1st Open Womens 12’6”) leading the womens field in their respective classes. Special mention also goes to the junior (under 16) paddlers who tackled the open race today and came out with great results. 15-year old Sunshine Coast young-gun Trevor Tunnington finished 9th Overall and took out out 3rd place in the Open Mens 14’ class, whilst fellow 15-year old’s Ke’ale Dorries (Palm Beach, QLD) and Drew Gullis (Casurina, NSW) finished a very respectable 6th and 9th respectively in the highly competitive Open Women’s 12’6” Class. These kids are the future of the sport and you’ll surely be seeing their names a lot more on the race results pages. 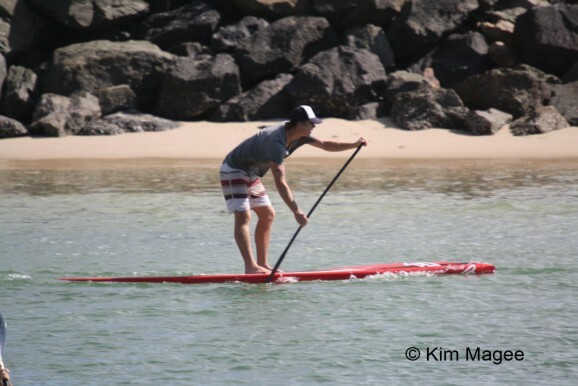 Pics thanks to Kim Magee. 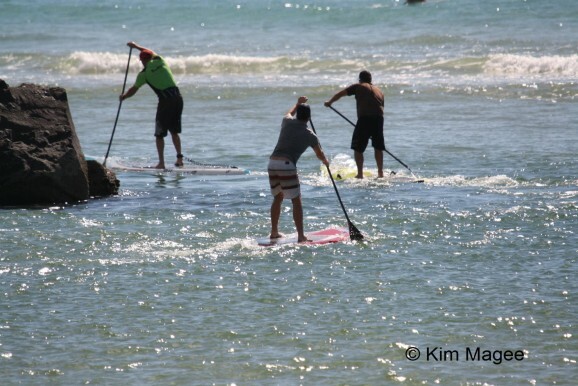 Check out the full photo gallery on Facebook.